When your Maytag washing machine stops working properly, you can narrow down your troubleshooting by looking at the display for an error code. The codes identify specific problems with your washer, which allows you to fix them as quickly as possible. The error codes that will appear in your display depend on the model you have, so it helps to familiarize yourself with those you're most likely to see. Maytag washing machines on display at a store. To alert you that there are excess suds in the machine, Maytag's Bravos line of washers show an "Sd" code, while the Maxima models show an "Sud" code. When your washer detects excessive suds, it automatically runs a suds reduction routine. To prevent excessive suds, use only a high-efficiency detergent in your washer and follow the instructions on the label for the proper amount to use. Maytag's Bravos washers will display an "oL" error code to indicate that the machine is overloaded. 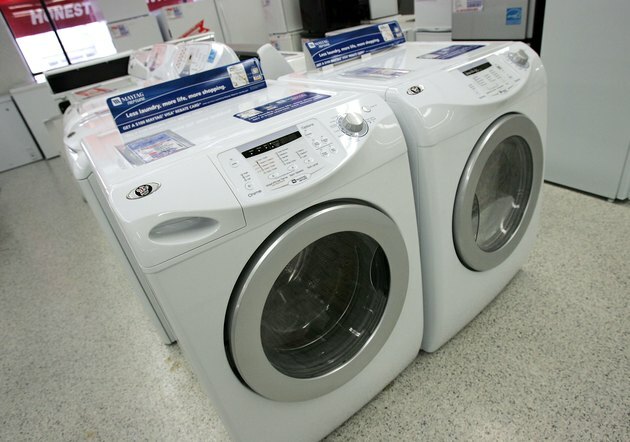 When the washer detects that the load is too large, it automatically drains any water and detergent in the tub. Remove a few items from the washer, close the lid and press the "Start/Pause" button. The "uL" error code will appear in a Maytag Bravos washer's display when its load is not balanced. The washer automatically runs a load-balance correcting routine, so allow it to finish. If you notice the dial is flashing and the machine has stopped, though, you'll need to redistribute the load before you can restart the machine. Close the lid and press the "Start/Pause" button to start the cycle. Error codes in your Bravos washer's display may indicate a problem with water coming in or going out of the machine. The "LF" code indicates that the washer is taking too long to fill, while the "Ld" codes means it is taking too long to drain. In both cases, ensure that the drain hose is installed properly. It should connect securely to a tub or drainpipe with a drain hose form. If the washer is taking too long to drain, you may need to lower the drain hose so the end is no more than 96 inches above the floor. Check the hose for clogs if the washer continues to drain slowly. When your Bravos washer displays the "HC" error code, it indicates the hot and cold inlet hoses haven't been installed correctly. The code appears at the conclusion of the wash cycle to alert you that the cold water hose is connected to the hot water inlet and the hot water hose is connected to the cold water inlet. To correct the problem, switch the hoses to their proper inlets. A Bravos washer has several codes that can alert you to a problem with the washer's lid. The "dL" code indicates the lid cannot lock, so an item in your laundry load is likely blocking it. Move items around in the tub to remove any obstructions. The "lid" error code indicates the washer's lid is open, so close the lid to clear the display. When the lid is open for more than 10 minutes, the washer will automatically drain and rest the cycle. Finally, the "dU" code appears if objects on top of the washer lid prevent it from unlocking. Remove any items, such as a detergent bottle or laundry basket, so the lid can unlock. In a Maytag Maxima model washer, the "dEt" error code appears if the detergent dispenser cartridge isn't detected. Remove the cartridge and reinstall it to ensure that it is inserted correctly. Check that the dispenser drawer is completely closed as well. You can ignore the code for single-load doses of detergent. The "F08, E01" error code in your Maxima washer's display indicates a water supply problem. Check that both inlet hoses are connected and water is flowing to the valves. The hot and cold faucets for your machine must be open as well. If the problem persists, examine the inlet valve screens for clogs and correct any kinks or pinched areas on the inlet hose. To clear the code, press the "Power/Cancel" button once. Touch the button again to restart the machine. If the code reappears, contact Maytag for service. The "F09, E01" code appears in Maxima washer displays when there is a drain pump system error. Check that the drain hose is properly connected, using a drain form to attach it to a drainpipe or tub. Examine the hose for any kinks, clogs or pinched sections and make sure the end of the drain hose is no higher than 96 inches from the floor. If you see the "F05, E02" error code in your Maxima washer display, the machine's door isn't locking properly. Press the "Power/Cancel" button to stop the cycle and open the door to check for items in the tub that may be blocking the door. Close the door again firmly and make sure it latches before restarting your cycle. The "F07, E01" error code indicates a motor drive error in your Maxima washer, so the motor is having a problem turning the washer drum. In most cases this occurs because the tub is too tightly packed. Remove a few items from your load and follow the load size recommendations in your owner's manual. If you have just purchased the washer, examine the tub to ensure that all the packing materials were removed. In both the Bravos and Maxima model washers, an "F##" or "F##, E##" code other than those listed indicates a system error. To clear the code, press the "Start/Pause" or "Power/Cancel" button. Restart the washer by pressing the "Start/Pause" or "Power/Cancel" button again. If the code appears in the display again, contact Maytag for service.